Why would I select you instead of the Other Podcast Media Hosting Companies that have Been Around Longer Than You? There’s value in all of the other podcast media hosts that are out there – this is sure. As podcasters ourselves, for 13 years now, we know what we’ve needed and benefited from in the way of hosting needs and we’re eager to share the great gear, experience and equipment that we have with other podcasters. We’re not the most-know, but we have a lot of great experience that simply can’t be matched. Do you have your own statistics package that allows me to see how many downloads I have via my files? We look forward to setting up a detailed statistics package (eager to offer you stats from the only certified statistics-based business currently, Blubrry) that is included in one of our outstanding service packages. What Type of Technical Support Do You Offer Customers? The Podcaster Matrix offers Technical Support to all customers via our focused contact form. If you’re experiencing a problem, please start your customer service experience with our contact form at our website here. Do Your Services Offer Customers SSL? All domain names acquired and utilized during your term of service with The Podcaster Matrix include an SSL at no additional charge. Can I just get basic FTP functionality and be done? You certainly can, and it’s one of our most-popular services. The fact is that most people just need affordable, trusted, confidence-inducing hosting for their media and want to pay less than what most of the services are offering. While we hope that one day you become the next big thing, the fact is, based on our 13 years of experience, that there will be an incubation period from where you start as a podcaster, until you reach podcast greatness/mega-downloads. Check out our services page and begin with our most-basic service package and grow from there as your program grows! Do you upload to Apple Podcasts? Remember that Apple Podcasts is NOT a “place to host your program”. Apple Podcasts is a directory listing of podcasts (one of the largest on the planet) that annotates and showcases your RSS feed listings to those utilizing iTunes, Apple Podcasts-powered directory listings and more. If you’re looking to get your podcast “set up on Apple Podcasts”, that’s a service we’re glad to help you with! Connect with us today and we’ll get you and your program all set immediately! Do you upload to Google Podcasts? Remember that Google Podcasts is NOT a “place to host your program”. Google Podcasts is a directory listing of podcasts (one of the largest and fastest-growing on the planet) that annotates and showcases your RSS feed listings to those utilizing Google Podcasts-powered directory listings and more. If you’re looking to get your podcast “set up on Google Podcasts”, that’s a service we’re glad to help you with! Connect with us today and we’ll get you and your program all set immediately! Can I move my content to another host? How do I move from another host to you? You login, download your stuff, and now you’ve got everything that we’ve got. Log into another service and upload the content. You’re all set and good to go!. The process to do this is listed inside of our video library to help you see exactly what to do. Are you pimping me out to make money off of my work? Not at all in fact if you choose, no one has to know that you’re utilizing our hosting services at all. If on the other hand you’re interested in growing your digital footprint, growing your audience and benefiting from surrounding your great programming with other great things, then The Podcaster Matrix is your first, best stop for satisfaction. You continue to own, control, and share your programming as you see fit. How does payment work with your operation? What forms of payment do you accept? We accept any major credit cards, direct deposit operations from your bank directly, or via PayPal. To provide you the best services, with the best gear, for the best price, we require that you provide detailed information and arrange for automatic, online payment monthly/annually. This can be accomplished by establishing a credit card-based payment method or utilizing PayPal There is significant savings by paying annually and we always encourage you to engage in it. What is your policy on free speech (aka, what kind of shenanigans can I get away with)? Ah, the strange realm of shenanigans. As you can read about clearly in our Terms of Service documentation, we (just like you) have the option of terminating your service at any time for any reason. While we’ll allow swearing and explicit discussions to be used, we will not, under any circumstances, tolerate what is clear, documented, on-going hate speech of any kind. What does that mean? That means that if we deem what you’re doing/saying as hate speech, you will be asked to leave and your account will be shut down. We are all adults here and want to make the best experience that will cultivate the best audiences and programming on the Internet and your hatred-laced speedbumps don’t help us do. Help us create “The Real World” we’ve been concepting since our journey began. How long will you continue hosting my program beyond the payment due date? If you anticipate there being a delay in payment, we should know about it ahead of time. Please use our contact form to notify us at least 7 days in advance of an anticipated problem. If a payment is processed and insufficient funds are available, an additional $25 processing charge will be levied for each instance. If an additional NSF notification is experienced, your account will be placed into suspension until your bill can be paid in full. The value of having less-expensive hosting services for your entire podcast library, is that you’ll pay your bill regularly, automatically, and make the process smooth. Let’s have a smooth process which is the cornerstone of you having a great customer experience. I have my own website and don’t need you to be listing any of my programs episodes on your website. How does that work with your service? Simply login, load your media files, paste the URL into whatever auxiliary service you have and, you’re off. While it can be that simple and straight-forward, there’s a LOT of valuable service available for a few simple steps up in cost that really do benefit you, your program and overall digital footprint. We look forward to helping you understand the value. Check out our services page for more detail, information and “whys” when you have a few minutes! Do you support the use of The BluBrry WordPress Plug-In? We sure do. Each of the Podcaster Matrix Staff members utilize it in their WordPress installs to manage content. It’s a great way to get the best, most-comprehensive WordPress-based plug-in working for you. Be sure to learn more about The Powerpress Plug-In from our friends at Blubrry now! Can I set up on Squarespace with your service? You should be able to set up anywhere with our services. From needing to implement a simple URL inside any one of any of the other podcast-related platforms, to making your entire library tethered to familiar, WordPress-created space inside The Podcaster Matrix. How Much Bandwidth = A Popular Show = Time to Pay More Money? We know the value of affordable podcast hosting space, as well as the bandwidth that pushes it all. Our experience is based on 13 years of performance, experience and dealings with podcasting on every level. We are interested in creating the best hosting experience for up-and-coming podcasters, for a fair price, that gets you taken care of. When you become the next ultra-hot property on the Internet, we’ll know because of the traffic you’re pulling from our server reporting and statistics packages. If you’re already having a great experience with us, wouldn’t you pay a little more to have that great experience to help propel the future of your budding podcast career? While everyone wants to be the next big thing, the fact is that we’ve worked with them all, and they’ve all stuck with us because we’re experienced, we’re diligent and we’re FAIR. Let’s talk more about what your expectations are and find a middle ground that makes fair the most-important piece of what a great podcasting experience is all the way around. Is there a referral fee for sending new customers your way? When and how often do I receive my reward? Finding those that also want a great podcasting hosting experience, at an affordable price is a vital piece of creating a viable business. To that end, we offer a 10% Finder’s Fee on all monthly customers, and 20% for annual customers. Your reward is awarded monthly for those that find a monthly-paying customer – twice annually for those that entice an annually-paying customer. Regardless of the package choice, it is an outstanding program that helps you reduce your cost significantly over the course of the year. NOTE: All referral fees stop if/when a customer referred to The Podcaster Matrix leaves our services or changes service levels. What other programs are hosted via the Podcaster Matrix? We are compiling a regularly-updated listing and are looking forward to showcasing you inside of it! 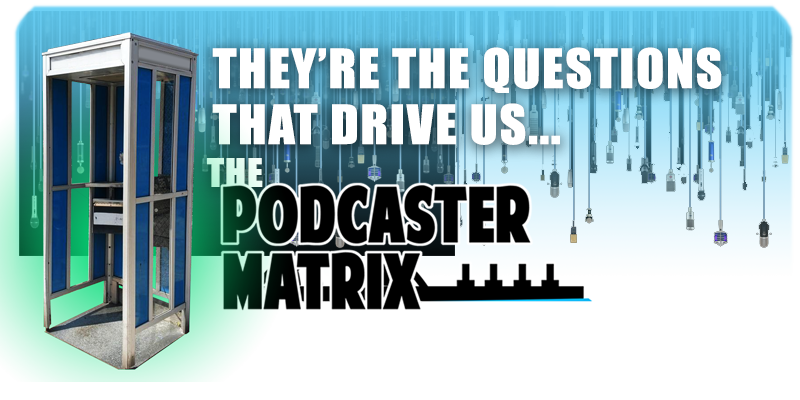 Fill out our contact form now to join our newsletter to be made aware of all that’s going on inside The Podcaster Matrix. What are your general terms of service? Be sure to check out our complete Terms of Service, which is supplemented by this always-evolving series of Frequently Asked Questions (FAQs). Still have questions? Looking for more details? Simply connect with us to get the answers you need! Do you submit to Spotify? Nope – you do. Spotify prefers that YOU be the entity that submits YOUR program, so get to it! You’ll find the information to get that process started right here. If my files utilize licensed music/sounds/material, can I still host my program on your servers? No, you can’t. If you upload content that contains unlicensed materials that you didn’t create or own, that program will be removed, and you will be notified of it’s removal. A second experience doing the same will freeze your account for three days. A third occurrence initiates a 30-day suspension of your program’s library files. A subsequent instant occurring within 30 days will terminate your current services with The Podcaster Matrix. You will have 3 days to remove your files from our servers before potential deletion. Can I just record my portion of the podcast, send it to you, and (for a fee) it eventually just appears in place? Yes, you can. The Podcaster Matrix is just one of a variety of services that constitute an entire podcast creation engine that can literally take you from a RAW audio file, to an edited, completed, published and promoted podcast. Be sure to connect with us to learn more about how all of these services can be initiated today! Does your service support video as well as audio media files? What is your stance on exploitative/x-rated materials being hosted on your service? Exploitative/X-rated materials are not allowed, at all. Any material (text, documents, audio, video, media files of any kind) that we deem to fall into these or other unacceptable categories during regular spot/random checks, will be removed instantly and your account suspended indefinitely. There is a no tolerance policy regarding these materials. I have multiple programs. Will I be charged per different program or as a whole for having media space with you? At this time, all Podcaster Matrix accounts foster ONE program, not multiple programs. The whole goal of offering you affordable, quality, experienced podcast media hosting, is that you utilize the services offered to you and stay within the very straight-forward guidelines you are given to benefit from them. IIf everyone could have as many multiple-program podcast files as they wanted hosted, at an affordable price – you would be hosting with them and not us. Let’s make this a great, cost-effective, successful experience! If I become the next Howard Stern (a popular show with millions of downloads, attention and large bandwidth bills) what happens with my agreement with The Podcaster Matrix? Your cost will go up to accommodate the organization that helped you get found who still fosters your sustained, newfound fandom and success. Next question! Who owns the podcast content if there are multiple host and one wants a divorce? One of the most important conversations that Podcasters should be having LONG BEFORE there is a potential divorce moment, is who actually owns the content, and what will happen to that content if you eventually part ways. While we “don’t have a service” for that here at The Podcaster Matrix, we are definitely interested in you and your co-host(s) having the conversation now, rather than later when everything (including your wits’ end) are on fire. Have the conversation now. Can I schedule a post on your platform if I am not using WordPress or other my own site? You sure can! Our submission platform will provide you with the opportunity to submit the details, imagery and links that’ll get your podcast alive and kicking in now time! It’s just another part of the great service that is The Podcaster Matrix! Do you offer a Podcaster Matrix mobile app? The Podcaster Matrix website is completely mobile-friendly, and, because we’re utilizing the world’s most-utilized publication system, WordPress, you are able to access and administer content from anywhere on the planet as long as you have Internet connectivity. I want to change my package (to either a larger or smaller package) – how do I do that? Changing your package with The Podcaster Matrix is simple. Simply utilize our contact form here to alert us as to how you’d like us to change your account. Please note: Only one-change per 6 months is allowed unless otherwise specified by a Podcaster Matrix Account manager. I’m ready to terminate my account with The Podcaster Matrix. How do I do that? Simply utilize our contact form here to alert us as to how you’d like us to terminate your account. Please allow 24-48 hours for processing. What social media platforms (SMP) can your content be shared to? The Podcaster Matrix website is able to help you share to a variety of social media platforms. Simply click the appropriate icon near the content you want to share and follow the prompts. Also be sure to take a moment to ‘Like’, “Follow” and – whatever else you might do with The Podcaster Matrix via the icons available at our contact page on our website. Thank you for your cooperation. Do I have to have a website to utilize The Podcaster Matrix? Nope! Just know that you are really missing the boat when it comes to potential footprint, listener engagement, and potential monetization if you don’t have a website. Connect with us and we’ll get you in touch with people that can help you change your circumstances, plans and future! Do you host programs from other areas beyond the United States? Not yet, but with a great series of package plans, outstanding technology, and the experience we offer, we’re eager to help podcasters everywhere make the best possible platform for their listeners AND themselves! I would like to get a domain name. Can The Podcaster Matrix Register it and manage it for me? We sure can! We’ve been doing this for podcasters since 2005 and we’d love to call you a domain name/library customer as well. Simply fill out the appropriate contact form to tell us more and we’ll get the domain name registered for you (only $8 annually, less for multiple year registrations) and remember – you own the domain name – not us. If I own only a domain name, can I make my entire library inside The Podcaster Matrix, and just point my domain name to the “front end” of that listing? You sure can! That’s what we do with all of the podcasters that we’ve ordered domains for. By the way, if you’re interested in having us acquire a domain name for you, we get them for just $8/year and will administrate it as part of your service package. Do you sell any podcasting gear? No, and if you’re waiting to have “the perfect podcast gear set up” to get started – DON’T! Connect with us today via our contact form and let’s talk more about getting your program launched, hosted, and heard by the millions of potential listeners across the globe today! Do you support Blubrry statistics? Yes, we do, in fact most of the podcasts that are hosted on The Podcaster Matrix, are current Blubrry statistics customers and have been for a long time. There is no requirement to have files hosted on Blubrry to take advantage of their excellent and detailed statistics package and we recommend them to anyone that has any interest in learning more about how their listeners are taking in their content. What if my podcast is not showing in Apple Podcasts, Google Podcasts, other services/listings, etc.? Who can help me? We can! In addition to providing you affordable, experience podcast hosting services, we’re excited to help you grow your listener base! Connect with us today and we’ll help you reach more listeners by registering you via the greatest listings for podcasts on the planet. It don’t take long, it won’t cost a lot of money (varies depending on how many services/listings you want to be listed on) and you can have it done right now. Connect with us! How many episodes must I have to sign up for service? We’ll always recommend that you have at least 4 podcasts put together, not only to showcase your interest in podcasting, but to also offer your future listeners an initial short library that allows them to get an understanding of what you’re offering as content creators. How long can my episodes run? There are no current limits on how “long” an episode can run. An episode of a podcast can be a couple of minutes or several hours. Whatever time it takes to provide the story, perspective or instance of what you and your hosts are here to share – that’s why we’re here. Interested in having something longer than 3 hours? Contact us today to tell us more of what you have currently or have planned and we’ll help guide you into our platform! Can my files feature explicit language/swear words/suggestive content, etc? You’ll be uploading .MP3 files when choosing to utilize The Podcaster Matrix Podcast Media Hosting services. The Podcaster Matrix Podcast Media Hosting Server doesn’t care where you’re getting files “from” – just that you’re putting them inside the folder(s) you’ve been assigned on board the server via your provided credentials and information. Still have questions about where you can/should be putting files to have put into place for use via The Podcaster Matrix? Connect with us and we’ll get you taken care of! Let’s start with “No”, but why send up a massive file for no particular reason? The Podcaster Matrix mounts regular review efforts of all files, especially larger files to ensure that security, server integrity and our implemented rules are being followed. Can I use your service as a file mirror for redundancy? Certainly. While we’re happy to help provide you peace of mind as the second string server offering, we’d always like to be considered first string as we save you cash, provide you valuable experience and support! How do I edit/delete episodes? You’ll be utilizing your chosen audio editing software to make alterations to your audio files. Remember that The Podcaster Matrix has also partnered with the most experienced Podcast Editing Service on the Internet – The Editor Corps – a talented team of OG Podcasters/Editors who can help you reclaim the time and effort you waste sitting in front of an editing stack that you can use to capture/make more content. If you’ve never thought of off-loading your editing, you’re crazy and need the warm blanket of a trusted, experienced editor. Connect with them. In regard to deleting episodes, that’s easy as well. If you’re utilizing FTP – utilize your credentials, access the appropriate directory, click it – and delete it. If you’re utilizing WordPress via the Powerpress interface, then you should also know how you’re deleting THOSE episodes. If you aren’t familiar with it or have forgotten, connect with The Podcaster Matrix Support Staff via our contact form and we’ll get you taken care of! What is the best way to connect with you when I have a problem? Without question, our contact form will be the best way not only to connect with us, but to ensure that there is solid documentation of the details of your problem, the suggestions we offer to fix it, the final solution we’ll get for you and your sense of satisfaction when it’s all said and done. Let the contact form filling out begineth! Are you going to use my Email address and connection information to make money/sell it to another organization? The Podcaster Matrix has many customers, connections and friends. We will not be selling any of the collected data from them, to any third-party organization. Ever. What happens if Podcast Matrix receives a copyright complaint or DCMA? IF/WHEN The Podcaster Matrix receives a complaint letter in regard to any content, after initial review, your account will be immediately put into suspended mode to continue the review to determine what is going on and to consider the validity of the complaint. For more details, steps and what awaits those that find themselves in this position, please check out our Terms of Service. Will The Podcaster Matrix be sending me an update message/newsletter to stay aware of new services, details, etc? We will, in fact, we’re continuing to build our mailing list, and information sections as well as a full support library of video to help you have the best experience possible for your hosting and other services we can provide for you. Be sure to connect with us via our contact form, and we’ll be sure to add you to the listing, to share more details, information and news. Can’t wait to hear from you!